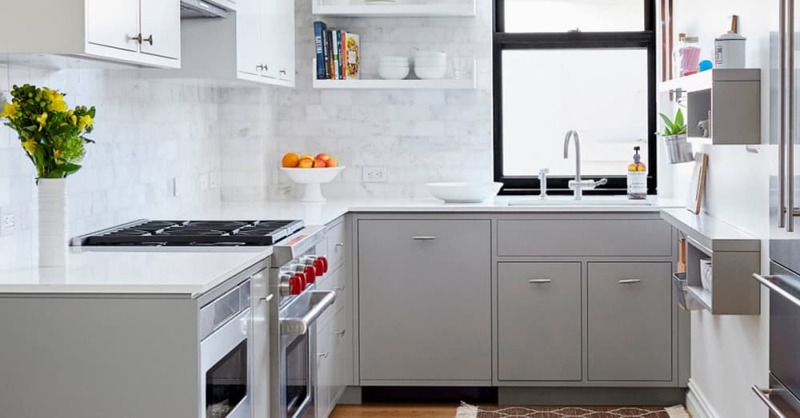 Read on to find out how you can make the most of your small kitchen space. While most people would jump at the chance of having a large kitchen, this is not always possible depending on the layout of your home. Rather than footing the bill for a home extension, there are creative ways that you can utilize your small kitchen space to fit the needs of your family. If you read my previous article on designing a new kitchen and took note of the tips that I gave, you would have already created a wish list for what you want from your new kitchen. If you have been working on this list for a while, then you’ll probably realize that there is a lot on there. The number of ideas you have will most likely be too much for your available space and probably your budget too. Prioritize your wish list and make compromises Since you can’t have everything on your wish list, you will need to go through and prioritize the things that you really do want over those that you can do without. Some ideas or wishes you may be able to compromise on, so have the mentality of ‘I can do without this if I can have that’ when cutting down your list. Working with a small space, you need to make sure that you organize it in a way that is going to provide the best functionality. Older houses in particular usually have a closed off kitchen rather than the open plan ones that we see in modern homes. Consider whether knocking down a wall will allow you more space that you can utilize effectively. When your kitchen lies directly next to a dining room or other room, see if you can expand your kitchen out to use some unused space of the adjacent area. If your laundry is right next to the kitchen, look at whether you could knock down the dividing wall. You could incorporate a stacked washer/dryer combo and have room for an island or more cupboard space. Sometimes swinging doors encroach on all important space, so it may be useful to remove doors that are not needed or replace them with bi-fold or sliding doors. Dead corners are a waste of valuable space, but you may be able to utilize them. Think about moving a cooktop or sink into this space. Having enough storage space that is easily accessible is vital to a functionable kitchen. When organising your cabinetry, you should always take into account the needs of the person who does the most amount of cooking in your home. If that person is short, there is no point installing high cabinets that they won’t be able to reach. In addition, if that person is elderly and has trouble bending down, then floor cupboards are not going to work either. The main cook in the household should have great input into the placement of cabinetry and where they sit in relation to counter tops and cooking appliances. Before designing the size of cupboards and drawers, make a list of all the items that you will want to store in your kitchen. If you have a lot of big items, make sure there is space for them. Do you always have a lot of food in your pantry? Ensure the new one is going to be able to accommodate this. Put all of your items into groups so that you can easily store them together; e.g. all pots and pans in one cupboard or drawer. Frequently used items such as glasses should be easily accessible. Think about their placement in relation to the fridge as having them on the opposite side of the kitchen could become frustrating. Also think about the items that you use regularly for preparing meals and how easy they are to access when working at the counter. Don't forget about using empty wall space for shelving. Shelves are a great idea to keep items that you want to be easily in reach such as coffee, tea or seasonings. Large appliances are often focal points of a kitchen, so you need to be wise about choosing the right appliances for your needs and ensure that you can place them in your kitchen effectively. In this day and age with the advancements that we have made in technology, there is no need to buy big clunky appliances that take up a large amount of space. Take some time to learn about appliances that will give you the same high-quality performance but have a smaller design. One great advantage in some kitchen appliances is that they are multi-functional. You may find that you don’t need two appliances when you can buy one that can perform different tasks. If you have a small family and don’t use your oven to do a lot of baking or roasting, why not consider buying a combination microwave oven which will allow you to bake or roast when you need to. An induction cooktop is perfect if you are lacking in counter space as you can use it both as a cooking surface and counter area. If you don’t like the idea of a wall or ceiling mounted rangehood that sticks out like a sore thumb over your cooktop, consider a downdraft ventilation hood. These are ideal when space is limited as they can be hidden away in your cook space until it’s time to use it. A ventilator power pack hood is also a great idea as it is unobtrusive and can be easily added to existing cabinetry without taking up precious space. When you are already tight on space, you don’t need infrequently used appliances taking up room that could be used for something else. Do you really need your washing machine or freezer in the kitchen? Could they be moved to an adjacent place? If you have a clear adjacent wall space, think about whether you could use a stacked washer/dryer combo there. Not all small kitchens allow for seating but if this is something that you really want to have, you may need to get creative. Freestanding tables are going to take up too much room in a small kitchen, so this is really not an option if you don’t have the space. When you have a table, you also need to consider walkway room which is probably valuable space that you could be using for something else. The best way to incorporate seating into your kitchen area is by utilising the counter tops. You are able to make good use of space by having cabinetry below for storage and you can use the counter tops for preparing meals. Find some stools that can fold down and easily be stored away in a nearby cupboard when not in use if you would prefer not to have permanent seating. Breakfast nooks are a great idea if you have free wall space because you can create seating against the wall without needing walkway space to get around like you would with a table. Consider an integrated fridge. Integrated fridges use the same cabinetry finish as your other cupboards so it blends in. This is ideal for those that don’t like the idea of a white or stainless-steel fridge standing out in their kitchen. Look at having a corner sink. While the idea of having a corner sink may not be ideal for some especially if there is no window, it can free up valuable counter space on either side. Wider sinks can be multi-functional. Some wider sinks around 30” to 36” can come with food preparation accessories. You can use these sinks for chopping, draining, rinsing and of course washing. Don’t scrimp on lighting. Even though your space is small, lighting is still very important as it can add personality. Accent lighting adds drama while task lighting gives practicality. Keep colors and materials simple. Multiple colours and materials can make a small space look cluttered so by choosing a monochrome color scheme you can avoid this. Lighter colors such as cream can make a space appear bigger than it actually is. As you can see there are many great and innovative solutions for designing your ideal kitchen in a small space. With some creative and careful planning, you can easily build a kitchen that is functional and suits the needs of you and your family. If you haven’t already, don’t forget to check out my tips on designing a new kitchen to get a great start on your planning.